Home > Local Store Coupons > Kohl’s: 20% off Clearance Plus Kohl’s Cash! Kohl’s: 20% off Clearance Plus Kohl’s Cash! Get an additional 20% off Kohl’s clearance items by using code FRIEND20 at checkout! Plus right now Kohls.com is offering 99¢ shipping per item! You even get $10 in Kohl’s cash for every $50 you spend before 10/14. 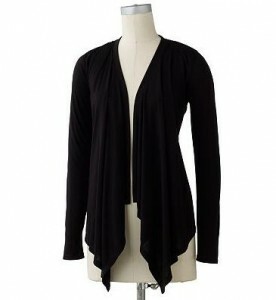 Get the Open-Front Cardigan above for only $14.40, originally $48.